Hygiene is an essential factor in the processing of ice cream. This requires a good and controlled cleaning of the processing equipment. CIP(Cleaning-In-Place) system is designed. CIP(Clean-in-Place) is a method of cleaning the interior surfaces of pipes, vessels, process equipment, filters and associated fittings, without disassembly. Up to the 1950s, closed systems were disassembled and cleaned manually. The advent of CIP(Clean-in-Place) was a boon to industries that needed frequent internal cleaning of their processes. Industries that rely heavily on CIP(Clean-in-Place) are those requiring high levels of hygiene, and include: dairy, beverage, processed foods, pharmaceutical, brewing, and cosmetics. The benefit to industries that use CIP(Clean-in-Place) is that the cleaning is faster, less labor-intensive and more repeatable, and poses less of a chemical exposure risk to people. CIP(Clean-in-Place) started as a manual practice involving a balance tank, centrifugal pump, and connection to the system being cleaned. Since the 1950s, CIP(Clean-in-Place) has evolved to include fully automated systems with programmable logic controllers, multiple balance tanks, sensors, valves, heat exchangers, data acquisition and specially designed spray nozzle systems. Simple, manually operated CIP(Clean-in-Place) system can still be found in use today. 1. Deliver highly turbulent, high flow-rate solution to effect good cleaning (applies to pipe circuits and some filled equipment). 2. Deliver solution as a low-energy spray to fully wet the surface (applies to lightly soiled vessels where a static sprayball may be used). 3. Deliver a high energy impinging spray (applies to highly soiled or large diameter vessels where a dynamic spray device may be used). 4. Elevated temperature and chemical detergents are often employed to enhance cleaning effectiveness. 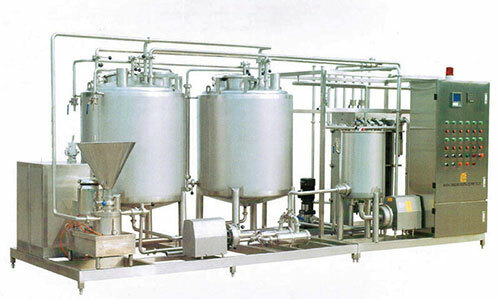 Ice cream pro-mix sterilizing plant is the special ice cream whole set sterilizing equipment. It is a kind of production flow line device integrating dispensing, preheating, homogenzing, sterilization, heat preservation still CIP(Clean-in-Place) cleaning. I hope, you are well in good health and your biz prosperous. Much appreciate your favorable reaction.